It is soon to be the most wonderful time of the year, yes I am talking about Christmas. The holiday season is upon us, and with it comes more friends and family gatherings, gift exchanges, holiday dinners, and perhaps more traveling. It is a busy time of the year for you, as well as your dog. Your dog’s routine will be interrupted, and that could cause some stress and anxiety to your dog, causing your dog to resort to some bad behavior issues like chewing, barking excessively, or being destructive. With that going on, neither you nor your dog will be feeling very festive. If you take the time to plan ahead for your dog’s needs during the busy holiday season, then both you and your dog will enjoy a more calm and less stressful holiday. The tips below will help you keep your dog safe and stress free. You may have a dog that loves to chew on sticks, and the sight of you bringing in a huge chew stick that is your Christmas Tree, will have your dog wagging its tail with excitement. You need to take precaution, to ensure your dog will not start gnawing away at your tree. Some dog owners choose to do without a tree, because their dog cannot be trusted around it, and others set up baby gates around their tree to keep their dog away from it. A good idea is to place your tree in a corner, to limit your dog’s access to it. You might have to only decorate the top half of the tree, and keep the lower half bare so that your dog can’t get to the ornaments. Another option is to place aluminum foil on the lower branches as a noise deterrent to keep your dog away. If you own a male dog, he might mark his territory by peeing on the tree. Something to be aware of. If you plan on having a real tree in your home for Christmas, be sure to keep it securely anchored so that it doesn’t tip over and fall, possibly injuring your dog. With a real tree you want to keep a close eye on the water, and make sure your dog does not treat it like a drinking bowl. Tree water may contain fertilizers and cause stomach upset, and the water is a breeding ground for bacteria when it is left stagnant. Be sure to keep the water covered so that your dog doesn’t get tempted to drink from it. With an artificial tree, you also want to make sure to have it securely anchored, to prevent it from tipping and falling over. Be careful of the needles from artificial and real trees, and keep them cleaned up and off the floor, because if your dog ingests them it can cause punctures to the intestines. Ornaments can be hazardous to dogs, and you need to keep a close eye on your dog around the tree. Broken ornaments can cause injuries, and if your dog ingests any ornaments it can cause intestinal blockage, or even toxicity. Electric lights become dangerous if your dog chews on the wire, your dog could get burned, or get a shock. It is best to keep lights away from the lower branches of your tree, to avoid any dangers and to keep your dog from getting tangled in the wires. Be sure to hang any precious ornaments, or breakable items high enough so that your dog can’t get to them. Same goes for any food ornaments, like homemade salt dough ornaments, chocolate ornaments, strings of popcorn and cranberries, keep them out of reach, or do not put any food based ornaments on the tree at all. Your dog will be intrigued by all the shiny objects, and may decide to pull them off the tree and chew them. I remember my first Christmas with my Golden Retriever Ellie, she was a puppy and treated our Christmas Tree like her personal chew toy. She would circle the tree and pull off any ornament that she liked, and I would have to chase her to get it back. It was a game to her, luckily they were soft plush ornaments and no damage was done to her, however I did lose a few of my ornaments due to damage. All of these plants are toxic to dogs and should be kept out of reach. Poinsettias are mildly toxic, and Holly and Mistletoe are far more dangerous to your dog. If ingested these plants can cause vomiting, diarrhea, difficulty breathing, and more. If you suspect your dog has ingested any amount of these plants you should call your vet immediately. The twinkling lights of burning candles can cause curiosity in your dog, and it is another source of danger. Your dog can get burned, and one wag of your dog’s tail can easily knock over a burning candle and cause a fire. Be sure to keep burning candles out of reach and away from your dog. A good idea is to use battery operated candles. During the holidays most people want to fill their home with fragrances of the season, but the different scents and chemicals in the air can cause your dog to become sick. A dog’s sense of smell is far greater than ours, and your dog will be sensitive to any fragrance in the home. Scented candles and air fresheners, are filled with synthetic fragrances and emit toxins into the air, which are dangerous for your dog and yourself to breathe in. Potpourri should be avoided, as it is toxic to your dog if ingested. Your dog could also be allergic to scents, so it is best to avoid any chemical fragrances. A natural way to make your home smell amazing during the holidays is to fill a saucepan with water, bring it to a boil and add cinnamon sticks, cloves, orange rinds and apple peels, and let it simmer. Your home will smell like Christmas and the scent is all natural and will not harm your dog. Be sure to keep your dog from chewing and ingesting any wrapping paper, ribbons and bows, and don’t wrap your dog’s neck in ribbon or tinsel to make your dog look festive, it is a choking hazard. Chocolate is usually found in abundance during the holidays in many households, and it should be kept away from your dog. Chocolate is toxic to your dog, and the levels of toxicity vary depending on the type of chocolate, how much was consumed, and the size of your dog. All chocolate should be off limits to your dog. The ingredient that is found in most sugar-free baked goods is a sweetener called Xylitol, and it is extremely dangerous to your dog. Xylitol is used in many sugar-free products including sugar-free gum, so be sure to keep any purses of visiting guests off the floor and out of reach of your dog. Most people either love fruitcake or hate it, and it can usually be found in most households during the Christmas season. If you are one of the people that hate fruitcake and think you are doing yourself a favor by offering it to the dog, think again. Fruitcake is very dangerous to your dog. The ingredients of raisins, currants, and yeast dough, that are in fruitcake are a bad combination for your dog. As tempting as it may be to offer your dog some tasty leftovers, it is not a good idea. Fatty and spicy foods are not good for your dog, and bones are dangerous. Turkey bones can easily splinter, and become a choking hazard and puncture your dog’s digestive tract. The high fat content, seasoning, and salt of leftovers can cause stomach upset, and can lead to pancreatitis. The holiday festivities usually include alcoholic beverages like eggnog, punch, wine, and cocktails. No matter what alcoholic beverages are consumed, they should be kept away from your dog. Even a small amount of alcohol can cause vomiting, weakness and seizures. Don’t let any of your friends or family offer your dog alcohol, to get some laughs, it is extremely dangerous. You know enough to keep your medication out of reach from your dog, but if you have visiting guests during the holidays you will want to make sure that they keep any medication securely locked up and tucked away from your dog. Dog’s enjoy the comfort of their home and surroundings, and any change of familiarity can cause stress and anxiety in your dog. If your holiday schedule involves traveling by car, and you are bringing your dog with you, then it is a good idea to take some of your dog’s favorite toys, blanket, or bed, and regular food. If your dog sleeps in a crate, you can pack that too, so that your dog will be able to feel more at home and comfortable. When my husband and I traveled overnight for the first time with Ellie to my parents house for Christmas, we packed up her toys, blanket, and her crate. When it came time to go to bed, she wanted nothing to do with her crate or blanket, and instead she jumped up onto the bed with my husband and slept. She pretty much took over the whole bed. Now whenever we go to my parents house she sleeps on the bed, and during the day she sleeps on the couch. She has definitely made herself at home there. If your holiday plans involve air travel, or you simply cannot take your dog with you because your dog doesn’t travel well, or a friend or family member has allergies, then boarding your dog is an option. Be sure to research and choose a boarding facility that meets your dog’s needs as well as your own. It is a good idea to check out the facility with your dog before you board your dog there. This way you can make sure it is clean and well maintained, and that it has enough indoor and outdoor space for sleeping and daily exercise. Letting your dog sniff around and get familiar with the surroundings will help to ease any of the anxiety of being dropped off at an unfamiliar place. 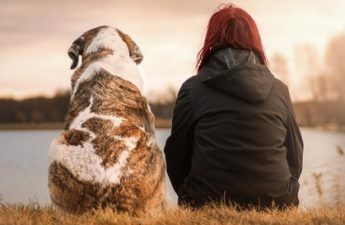 If boarding your dog at an unfamiliar facility makes you nervous, or you are just uncomfortable with the thought of leaving your dog at a strange place, then you should give yourself plenty of time to ask any neighbors or friends who would be willing to pet-sit your dog in your home or theirs. You could also research any pet sitters in your area who would come to your home to look after your dog. The more time you give yourself to prepare, the less stress there will be for you and your dog. If you are hosting holiday gatherings this year, make sure to plan ahead and inform your guests that you do have a dog, so that they are aware in case anyone suffers from allergies, or is not a dog lover. Let guests with allergies know, that no matter how much you clean, your home will not be allergen-free, and they should remember to bring their allergy medicine. Your guests will also want to inform you if they plan on bringing their own dog, and you may want to decline depending on how your dog or their dog reacts to other dogs. Visitors can be upsetting to dogs, as can the noise and excitement of holiday parties. If you have a dog that is shy or fearful of others, you will want to provide your dog with a safe and quiet area away from the noise and distractions, this can be a crate in a quiet room or area. Be sure to provide fresh water, and your dogs favorite toys and blanket, to make your dog feel safe and secure. Make sure your guests know that you do not want them feeding anything to your dog without your permission. Guests might fall for the sad puppy dog face that your dog gives while begging for food, but let them know that any food given to your dog should be approved by you. Holiday parties can get messy, with plates of food left unattended and leftovers in the trash, your dog could easily ingest something that he/she shouldn’t. Make sure to keep food out of reach of your dog, and keep a lid on the garbage can. With so many guests coming in and out of your home, you will want to keep a close eye on open doors and windows, your dog could easily get spooked and venture off outside. Make sure your dog is wearing a collar with an up to date ID Tag, in case your dog gets lost. Dog’s love and crave routine, it makes them feel safe and secure. It might not always be easy to keep your dog on the same routine during the busy holiday season, but it is important to try to maintain your dog’s regular schedule as much as possible. That means walking and feeding your dog at the regular times. A good idea is to set an alarm on your phone, so that you are reminded of when to feed and walk your dog when you are amongst all the distraction and visiting guests. Don’t forget to schedule some play time, and affection for your dog as well, that way your dog feels more at ease and not thrown off balance by all the activities. On the day of your guest’s arrival, a good way to relieve some stress and anxiety in your dog and yourself is to provide plenty of exercise. Take your dog for a nice long walk, and provide plenty of playtime, this way your dog will be well exercised and feel tired. A tired dog is a good dog. The busy holiday season can get pretty stressful, not only for you but for your dog as well. By making sure to give yourself plenty of time to prepare for any traveling that you will do, or for any visiting guests into your home, the less stress there will be for you and your dog. Keeping your dog safe and stress free is the important message, and by being aware of the common household hazards and dangerous food items, you will be well on your way to enjoying a happy holiday. Be sure to give your dog what he/she craves, and that is safety, security, routine and love and affection. How are you planning on spending the holidays with your dog this year? Do you have any other holiday safety tips for dogs that I forgot to mention? Please share your comments below, I would love to hear from you. Hi Jenny, this post is very thorough about all the ills that can befall a dog during the Christmas and holiday season. I was surprised to learn that dogs can get sick from eating fruit cake. Because our dogs are so much part of the family, it is so easy to forget that the majority of human food isn’t good for dogs and can actually make them sick. Your advice with regards to taking your dog on holidays is spot on. Dogs like the comfort and familiarity of their home and can become distressed when they don’t have familiar objects around them. It is always best to plan ahead and make sure your dog has his/her favorite toys and blanket when travelling. Hi Suzie thank you for your comment. Yes, fruit cake is very bad for dogs. It contains candied fruit, raisins, and yeast which is all toxic to dogs. When travelling with dogs it is important to remember that they will possibly be in an unfamiliar area, and that is why dog owners should always take their dogs favourite toy or blanket with them, that way your dog will be able to enjoy the holidays too. This is a great list and I do have two sweet dogs. I learned early on about the chocolate. My kids would open their stocking and leave them on the floor. We learned very quickly not to do that. Our dogs got into the chocolate and one got very sick from it. Thankfully, our vet told us what to do and it helped tremendously…saved his life. So wonderful suggestions and worth it for everyone to heed! Thank you for your comment. With so many dangerous items, food and non-food items, the holidays can be pretty scary for your pets. Chocolate is a big no no for dogs, I am glad that everything turned out well for your dog, and that your vet was able to save your dogs life. These are some great tips. Growing up, I noticed that our dogs would have a terrible time during new year’s eve celebrations because of fireworks. I feel bad for them as the noise could be too much for them. Also, a sudden wave of visitors can cause unexpected stress or anxiety, as you pointed out. It’s nice to have family over for the holidays but our dogs are family too! Jenny, Hi! It’s good that in the days of the pre-holiday bustle you published a caring topic about a devoted friend. Your advice takes into account the safety and content of your beloved dog as much as possible during the Christmas holidays. The dog may experience anxiety and stress from loud noises and festive noise. Also, children unfamiliar to her, can be an additional source of distribution.It is important that the owner was there in these cases. You also have to watch the dog not to get boiled bones, because the teeth break them and sharp pieces get into the stomach. In short, the attempts of the guests to feed the dog and play with it require additional attention from the owner. Hi Mark, thank you for your comment. I agree, that any children visiting in your home need to be supervised around your dog, for the safety of the children and safety of your dog. Dogs can be unpredictable, even if they are the friendliest dog, supervision is always necessary when children are involved. Thank you for bringing that up, and also mentioning boiled bones. Boiled and cooked bones are extremely dangerous to dogs and should never be given. I found some excellent information in your article, I really had no idea that there is so many toxic products in our homes, it really makes you think about what we are using on a daily basis. I have a boxer and when I first got him he felt like he had to chew everything, he even had a go at chewing the stairs at one stage. Thankfully now he has mellowed out and it is safe to have him in the house. I do agree with you that exercise is a great way to calm your dog and make them feel more relaxed. Thank you for your comment. Keeping your dog exercised and mentally stimulated is a wonderful thing. They will feel more calm and relaxed, and tired. After the puppy stage dogs do mellow out, and dog owners are always thankful for that, but after a while when your dog gets older you do kind of miss all of their crazy antics. We have a dog and a puppy. They always feel hungry when we are having our meals. Last year our dog accidentally ate a small piece of Poinsettias and ended up vomiting and sick. We had to bring him to the vet and gave him medication. Hi Christine thank you for your comment. I think everyone can relate to dogs always being hungry when humans eat. A good idea, when everyone is eating around the dinner table, is to offer your dog a Kong toy stuffed with a favourite treat, that way your dog won’t feel left out, and your dog will be kept busy. Yes, dogs should be safe and enjoy the holidays too. Great tips for our furbabies during the holidays! I’m lucky in that both of my pups leave the tree alone. However, our youngest puppy is a big boxer and she has gotten pretty curious about the small village pieces, particularly the old country outhouse. So my tip would be to remember your pets when you start putting your Christmas village together and ensure they are up high and secure. Do you have any tips on how your holiday guests should be introduced to your pups, particularly if they bring pups of their own? Hi Kris, thanks for your comment, and great tip on keeping any Christmas village items high up and out of reach of dogs. If your holiday guests plan on bringing a dog of their own, it is best to have them inform you ahead of time. This way their dog and your own dog can maybe have a meet and greet beforehand, to get used to each other and to see how they get along. If it is a surprise visit with their dog in tow, let the dogs sniff each other and get familiar with each other. It is always best to keep a close eye on the dogs and never leave them unattended, as you never know what will happen. Hello Jenny. It is almost Christmas and I needed these awesome tips to keep your dog safe and stress free during these holidays. If not for this post, I wouldn’t have figured out that some of these items used for Christmas are dangerous to my dog’s health. Thanks for the idea to go out with my dog (traveling) and also to stick around with it. Hi Barry, thank you for your comment. I am glad that my post was able to help you out, and I wish you and your dog a happy and safe holiday.